Pull up a seat and be our guest. What is your best advice for travelers to Cincinnati? Pack for all weather types. Even if it says it’s going to be cold, bring summer clothes as well. Also, make a reservation! What are some must-see spots? Some good jazz for music lovers is at Schwartz’s Point or Washington Platform. Definitely visit Fountain Square. There’s usually something going on there. Would you consider Mita’s a Cincinnati must-see? Where else can you go for such a great experience and great architecture? Where can you have shark, octopus, and beef tongue in the same day besides here? If you could spend a day in Cincinnati, what would you do? Definitely visit the Cincinnati Zoo. I love it. How far away do Cincinnati Zoo guests come from? I think we’ve seen visitors from every country around the world. A few summers ago, my team participated in some friendly competition to have conversations with visitors from the 50 states. The competition lasted barely a week before we had met people from all 50 states and 12 different countries! What is your best advice for travelers to Cincinnati? I love this question because I am actually from Denver and moved to Cincinnati in 2014. I’m often asked why I’m here instead of there. Cincinnati’s best-kept secret is finally being found out: this city is super fun, lively, and full of great culture, and it just keeps getting better. I would advise travelers to get out of their comfort zone and experience the things that make Cincinnati great—go to a Reds game (even if you don’t love baseball), try a gourmet hot dog from Senate in OTR (even if you don’t love hot dogs), taste Cincinnati-style chili (even if you decide it’s weird), rent a bike to ride along the Little Miami bike trail (even if you’re not a cyclist). You will be amazed at what this funny Midwest town has to offer. What is your best advice for a traveler to Cincinnati? Fit in and take your time. Cincinnati has changed so much, there’s so much new atmosphere to take in. What is your favorite place to visit in Cincinnati? Fountain Square, The Banks, and Washington Park. There is always something to do! What is the best local spot? I really like Via Vite in Fountain Square. Especially when it’s warm and you can sit outside and look at the fountain, it’s iconic. What question do you get most often from travelers? “Where is the Carew Tower?” I always tell them to look up! What is your favorite event to attend in Cincinnati? I love Salsa night on Fountain Square. Anything else we should know? Cincinnati has changed so much recently. Downtown used to shut down at 7 p.m. Now there are all sorts of events, fun bars, and interesting restaurants you can check out. What is your best advice for travelers to Cincinnati? Come during Reds season. During the summer, the city is always alive. Also, find local spots. There’s a lot of good stores and eateries like Findlay Market. How have visitors from out of town stood out the most to you? Usually they ask where to go and there is panic on their faces. What is your definition of great customer service in Cincinnati? 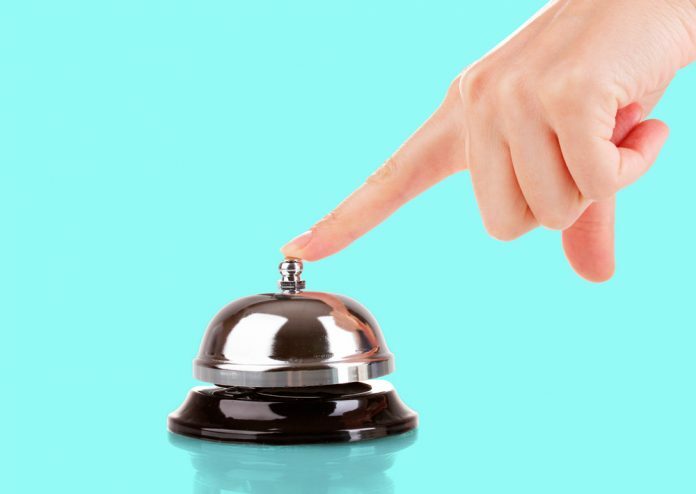 Being able to relate to the guest and always anticipate the person’s needs. As a visitor to Cincinnati, would you drive or Uber to your locations and why? It depends on where I’m staying. If I stay downtown, then definitely Uber because of slim parking [options]. Outside of downtown, I would drive. Has your position as a valet parker changed your travel habits? Yes, I drive more cautiously because of how reckless Cincinnati drivers are. How long have you been in this position? My mom, Anne Castle, bought the property in 1985 and we opened in 1987, so she gets the credit. It was her dream and creation. She passed away in 1991, so I took over as the innkeeper. What is most special about your inn? We are one of the few accommodations in this area in the heart of it all. No one else has this combination of accommodations. What is your best advice for travelers? A lot of people visit for the Hocking Hills State Park and for the love of the outdoors. There are 2,400 acres within the park, and it’s phenomenally beautiful any day of the year. What’s your best advice for travelers to Cincinnati? Check out the visitors center at Fountain Square. Very knowledgeable staff and centrally located. What’s your favorite spot to visit in Cincinnati? The transit center. Before I had this job I had no idea it existed. Now I like to walk over after a shift and just check it out. I hope it gets used more in the future! It’s a cool spot. What’s a must-see local spot? All of our theaters, like the Aronoff Center, are great. There’s also the Freedom Center, and I love sending people to the Carew Tower observation deck. You can see Kentucky, Indiana, and all of Cincinnati from up there! What’s your favorite event that you’ve worked? I like the pre- and post-Bengals games, asking what people thought. The Reds opening day parade is fun, you see all of the people in the parade. BLINK was really great and so different.